JAKARTA, Indonesia--(BUSINESS WIRE)--PT Tokopedia, Indonesia’s leading technology company, announced today that Agus Martowardojo has joined the company’s leadership as President Commissioner. Agus Martowardojo has over 30 years of experience as a banker, Finance Minister and Central Bank Governor. As the Governor of Bank Indonesia, Agus was active in maintaining the stability and resilience of the Indonesian economy by optimizing monetary, macroprudential and payment policies as well as management of Rupiah circulation. He issued innovative policies, including the Bank Indonesia 7-Day Reverse Repo Rate, that strengthened the transmission of monetary policy and integrated inflation controls across Indonesia. During his tenure as Minister of Finance from 2010-2013, Agus managed Indonesia’s fiscal policy in a disciplined and effective manner to drive growth and improve economic resilience. Agus played a role in increasing state revenues, improving the efficiency of state expenditures, and strengthening governance. During this period, Indonesia achieved an improvement in its debt rating from Fitch and Moody's to investment grade status. From 2005-2010, while he served as President Director of Bank Mandiri, Agus led the company’s transformation in which he strengthened Bank Mandiri’s performance, developed strategic business units, significantly reduced non-performing loans, and reinforced a performance-based and high integrity company culture. In the same period, Agus also developed Bank Mandiri's business through acquisitions, joint ventures, and strategic alliances. Agus joins Tokopedia as the company enters a new phase of growth and develops its ecosystem into infrastructure-as-a-service (IaaS) to empower and strengthen Indonesia’s economy in an inclusive manner, both online and offline. “Tokopedia has been consistent in its mission to empower Indonesian society through technology and support an economy that is fast-growing, balanced, and sustainable. 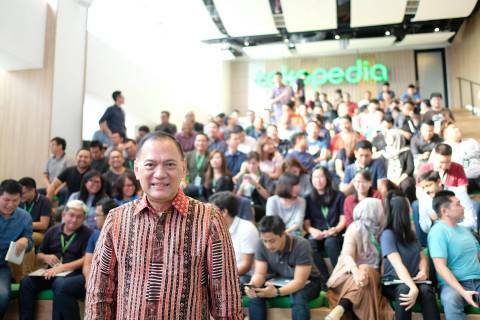 I am pleased to join Tokopedia and contribute my experience to support the company’s aspiration for inclusive economic development,” said Agus Martowardojo, President Commissioner of Tokopedia. Agus Martowardojo received numerous accolades in his tenure, including The Best Central Bank Governor in Asia Pacific from Global Markets (EuroMoney) in 2017; Finance Minister of the Year for Asia Pacific from The Banker (Financial Times) in 2012; and Asia’s Best Executive from AsiaMoney in 2006.